Hauser & Wirth Somerset is pleased to present, Pathetic Fallacy, an exhibition by Matthew Day Jackson. The exhibition consists of works conceived during his time as artist-in-residence at the gallery in Somerset since August 2018, and is presented in a range of mediums, including: painting, drawing, sculpture, furniture, and installation. 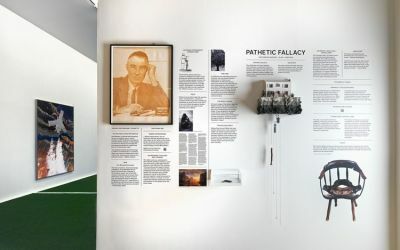 The exhibition’s title, Pathetic Fallacy, is a literary term used to describe the attribution of human emotions onto inanimate objects in nature. Throughout Jackson’s time in Somerset, this concept served as a potent tool in his continued investigation into society’s relationship with its environment. The subsequent body of work focuses on how we understand our natural world, and is further punctuated by collaborations with his family and the local community. The Rhoades gallery is occupied by the Solipsist paintings: aerial views of colourful, silkscreened Formica landscapes, with satellites made of poured lead hovering in the space above. The series title alludes to the self-referential nature of satellites, and Jackson’s observation that, ‘despite how far we have travelled, we are looking back in on ourselves, rather than investigating where we are going’. Jackson uses these unconventional materials frequently in his practice–the Formica refers to the material of table tops in his childhood home, and the poured lead to its own poisonous history. These paintings depict landscapes that are disappearing or transforming due to human intervention. The works have been ordered into the four elements, with each wall of the gallery representing earth, air, fire and water. A fifth element, aether, is represented by a scent, which Jackson has produced in collaboration with Bestscent and atomised throughout the space. In the same way that we attribute human emotions to the weather, Jackson sees these images as the Earth emoting, creating his own pathetic fallacy. Rather than seeing ourselves in the satellite shots, we only see the devastating effects of our presence on the planet, rendered in aesthetically pleasing colours. A series of works titled Mirrors is the counterpoint for the Solipsists. Interspersed throughout the exhibition, these mirror images reveal the process used to sculpt the lead satellites. This partner series functions as a relic, offering the solipsist the tool to see its own reflection. The floor has been carpeted in astro-turf with white lines, reminiscent of a sports field, whose pattern forms the golden rectangle–a geometric ideal that Jackson revisits frequently in his work. In the centre of the room sit two black Wassily chairs, originally designed by Marcel Breuer, but re-imagined by Jackson to seat Michaelangelo’s Pieta (1498–1499) and Kathe Kollwitz’s Pieta (1937–1938). While the ideology of the Bauhaus–‘form following function’–denied individualism through mass production, Jackson has subverted the practice by collaborating with local metal and leather workers to fabricate unique pieces. The seat and armrests have been altered to provide support to the burdened mother. A Yew tree sits in the smallest division of the golden rectangle. Often associated with death due to their use in cemeteries, in this context the tree alludes to the boundaries we impose on our lives from play to death. This mise-en-scène is related to a role-playing game that Jackson has been developing during his residency in Somerset, which can be viewed in the Education Room. The game, titled Maa, is set in an imaginary dystopian future roughly 1000 years from now. It has been devised for Jackson’s forthcoming exhibition at Serlachius Museums, Finland, where it will be published as a guide to the show. The game touches upon many themes found in the exhibition, from colour theory, to gender, sociology, and geopolitics. Jackson invites the viewer to participate in the make-believe, through his sculpture, paintings, events, and now more formally in a game. He is fascinated in the creation of identity and conjured worlds, ultimately with a belief that art has the power to build new realities.